Several weeks ago I taught a class on making soup from scratch at the Mississippi Market. The soup recipe was adapted from one used on a recent television appearance; modified to be within the parameters of a $10 meal for a family of four. The guidelines are pretty loose, and I took a few liberties, including homemade stock being... well... zero dollars. As I write this, I’m sitting in a friend’s living room in Colorado after a trip for the Thanksgiving weekend and I keep thinking of all the stock I couldn’t make from the vegetable scraps we produced for our meals. This post is another basic exploration of easy ways to stretch the use of products that we might otherwise not see the full return on investment from. Enjoy. Any vegetable scraps except potatoes, sweet potatoes, kale, cabbage, collard greens, beets, kohlrabi, or other vegetable you think might take over the flavor of the soup. Save the bones from roasted chicken, roasts, steaks, chops, ribs, or other meal (it’s best to separate the bones from the meat before people eat them to avoid pathogens). Or try shrimp, mussels, crab legs, or other seafood shells. I’ve been known to ask people to de-meat (is that a term?) their chicken and save me the bones before. I’ve also brought some home in to-go boxes from restaurants. No shame. As a general rule, I make stock once I have 2 quart bags full of scraps and bones. However, you can make stock from even a small amount of scraps, just beware you won’t have a large amount of stock. Empty the contents (frozen is ok) into a pot large enough to cover them entirely with water. 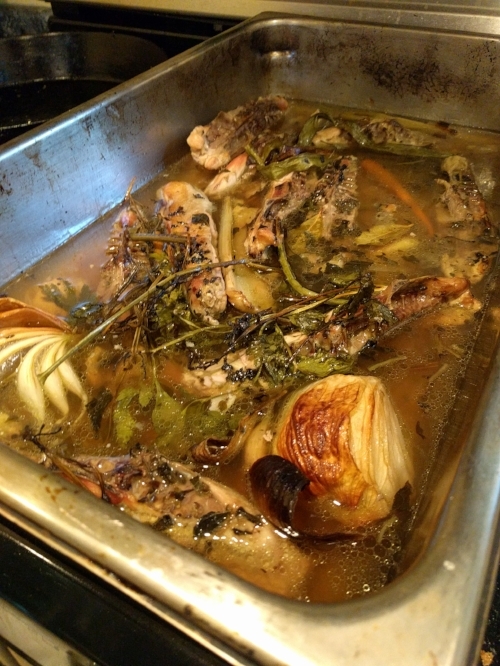 You can also roast your stock in the oven on a low setting (250 degrees or so) instead, using a large roasting pan. Cover the stock ingredients by 3 or 4 inches of water and bring to a boil. Reduce heat and simmer on a very low setting, uncovered, for several hours. Keep in mind the water will evaporate. If the water reduces below your ingredients, cover the pot. Taste your stock as you go. The ingredients will take a while to send their flavor over into the water. Any salt you add will concentrate as the water evaporates so be stingy with the salt until the end. When the liquid has evaporated below the ingredients, turn off the heat, allow to cool for a moment and strain the stock through a colander lined with cheesecloth or a fine sieve. Really you’re just looking to get the bones and big pieces out. Don’t worry too much if there’s still some things left floating in there. I actually find it really charming and realistic. If the liquid you’ve strained out is still too light for your liking, put it back on the stove and allow to reduce until you reach your desired concentration of flavor. This really all sounds like a lot of steps but keep in mind you’ve been collecting scraps throughout the past weeks and a stock pot boiling on the stove requires very little oversight. Plan to make your stock on a night when you’re home anyway doing other things. Once the stock is completed, allow to cool so you can skim off any fat. Placing the stock in the freezer for 15 minutes or so will help but I find putting it in the fridge overnight works too. Transfer the stock into old sour cream, yogurt or other plastic containers, being mindful to leave at least an inch of space at the top for the liquid to expand into when it freezes. I find 2 cup containers work really well. Once you get into the habit of saving scraps and making stock, you'll be saving yourself from spending extra on high-sodium cubes and cans of bouillon. I promise.